Is Eating Raw Garlic Good for You? Vampires may not like it, but garlic is a favorite for many other humans. A common ingredient used for preparing Italian dishes, sauteed or stir-fried vegetables, and a variety of sauces and marinades, this savory bulb is a potent way to spice up any number of meals—just have some gum on hand afterwards to freshen things up. In fact, garlic is so powerful (just one clove can flavor an entire pot of food), many often incorrectly think of it as an herb or spice. Technically, though, it’s a vegetable in the same family as onions, leeks, and shallots. But is eating it good for you? According to editors at Bon Appetit magazine who dug through research journals from the past century and created this pretty cool timeline of garlic’s claims to fame, the answer is yes. Though it still has benefits when it’s used in formal cooked preparations, raw garlic in particular is even more effective at providing a number of these health boosts. While you probably wouldn’t want to eat raw eggs or raw meat, when it comes to plant-based foods, eating them uncooked can unlock their potential, say proponents of raw diets. The main tenet is that cooking destroys the inherent vitamins in food along with nearly all of the immune-boosting nutrients. In this philosophy, preparation of food is super important. As a rule, no food is heated above 105-120 degrees, and nothing is pasteurized, homogenized, or produced with the use of synthetic pesticides, chemical fertilizers, industrial solvents, or chemical food additives. The movement can be traced back to the late 1800s, according to U.S. News and World Report, at a time when a prominent doctor by the name of Maximilian Bircher-Benner discovered “he could cure his own jaundice by eating raw apples.” From there, humans have been experimenting with how eating raw foods can affect health, and today the diet ranks in the top 10 for weight loss, according to the publication. The diet proposes eating 75-80 percent of your daily intake this way to reap the benefits, and while some do also eat sashimi (or raw fish) and cheese made from unpasteurized milk, most followers are vegan. This is where garlic can become a major component for raw foodies—even when uncooked, raw garlic is incredibly tasty and nutritious. Part of it has to do with its primary molecules, alliin and alliinase, which are stored in different cells in fresh cloves. The distinct flavor behind this plant happens when alliin reacts with alliinase, a process that is highly accelerated when cloves are crushed, cut up, or even damaged. 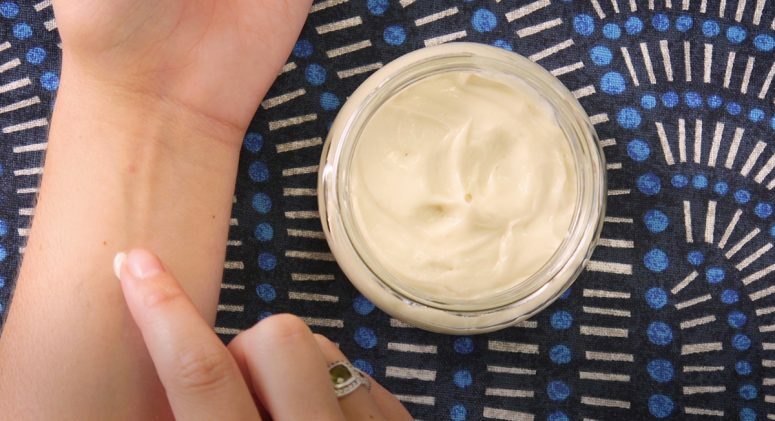 After about ten seconds of this physical activity, the two compounds merge to create the phytochemical allicin, a potent antimicrobial and antifungal agent. Since it’s relatively unstable, though, allicin degrades within a day. Heat will also destroy allicin, so the most beneficial use of garlic is consuming it raw, and within a few minutes of crushing the cloves. If you want to use garlic in a cooked meal, wait until the last few seconds of cooking to add in—or add what is called for in the recipe, and then throw in an extra bit of minced garlic near the end of the cooking time. You can also invest in garlic supplements to get a concentrated form of allicin if you can’t find ways to eat garlic raw, which shouldn’t be too hard. Doing so can help the body in a myriad of ways. Not only does allicin help give garlic its incredible taste, it’s also one of the most potent antioxidants in food and an incredible bacteria and fungal fighter. In fact, garlic was used during World War II to help soldiers fight against gangrene. It’s so powerful, in fact, that garlic supplements have been used successfully against strep throat, staph infections, and even anthrax bacteria. Although more research is currently underway, garlic seems to be especially effective in treating difficult infections where the body may have become resistant to certain drugs and antibiotics. In the fight against cardiovascular disease, garlic could be a key player. According to new research from UCLA, aged garlic extract helps “stop heart disease from progressing and, in some cases, even reverse artery plaque accumulation.” One of the factors is that garlic can reduce homocysteine, a marker for heart disease. The antifungal properties of garlic are so potent the plant has often been used to treat acne and some herbalists believe that garlic might have the ability to heal dandruff since it has been seen as proactive in fighting Pityrosporum ovale, a fungus that lives on the scalp and plays a role in the development of itchy, flaky skin. Allicin compounds have been linked to effective hair loss treatment as well, helping to actually slow shedding. Studies have shown that eating garlic can help reduce blood pressure, which in itself can prevent the onset of serious health issues. Eating garlic increases production in hydrogen sulfide gas that then expands blood vessels, letting blood flow easier and therefore putting less pressure on them to do their job. One of the most heavily studied benefits of garlic is its anti-inflammatory properties. Garlic contains four different sulphuric compounds that can help cut down on inflammation. This benefit can also extend to those with autoimmune diseases triggered by an inflammatory response as well as arthritis. In addition to all the benefits listed, garlic also provides the body with a good dose of nutrition with added vitamin C, vitamin B6, manganese, calcium, iron, and potassium. Obviously, since you’ll want to take advantage of the benefits of raw garlic, you should always purchase bulbs fresh. The main thing to look for is garlic that is undamaged. You’ll want to find bulbs that are plump and don’t have any broken outer skin. When holding the garlic, it should feel weighty; and when gently squeezing the bulb between your fingers, it should appear firm—not mushy or damp. Soft and shriveled garlic bulbs will not provide the same potent power as a fresh bulb, so you should heed any that have mold or have started to sprout (indicating the plant is older and near the end of its lifespan). 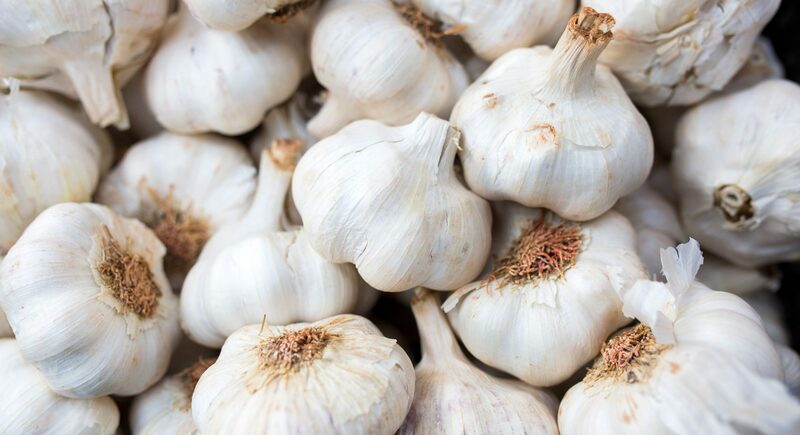 With good storage, a solid, well-wrapped garlic bulb can stay fresh for a month, or even longer. To keep the garlic as fresh as possible for as long as possible, store in a cool place (60-65 degrees Fahrenheit) that’s away from direct heat and sunlight. A little bit of humidity and air circulation is fine, but once you’ve broken the head of the garlic, know that the shelf life lasts for just a few days. 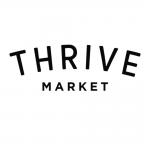 Here are a few of Thrive Market’s favorite ways to cook with garlic. This classic side dish is sure to be a crowd pleaser at the holidays or any day; even better, this recipe forgoes the loads of dairy that can weigh you down and feeling bloated. Instead, these perfectly whipped potatoes have a creamy texture from hearty olive oil that adds a good amount of healthy fats. To enhance the power and flavor of the garlic, hold off on adding it until the very end. Once the mashed potatoes have cooled a bit, stir in the garlic or sprinkle on top to taste. Bored with marinara sauce? Switch it out for this light yet savory kale-hemp pesto that goes great on just about anything, from pasta to roasted vegetables. It’s bright and beautifully green, and only takes five minutes to prep, using nutrient-rich hemp seeds and curly kale, sea salt, olive oil, lemon juice, garlic, and Parmesan cheese. (If you want to make the dish vegan, you can also sub in nutritional yeast instead of cheese). Chop up raw garlic, let it sit for a few minutes to get the allicin going, and then mix all ingredients together and pour over a bowl of cooked pasta noodles. The rich profile of raw garlic goes well with the intense flavors of fresh kale and smoky bacon in this dairy-free take on the classic Caesar salad (made with nutritional yeast to mimic the flavors of Parmesan cheese). To prep this dish, you’ll first want to massage the kale with a little bit of olive oil and salt, making the leaves more tender and easier to eat raw. Sprinkle a little bit of garlic on top to serve, providing a dish that’s perfect for lunch or hearty enough for dinner. A delicious recipe for roasted chicken is something every home cook needs; here’s one that’s easy to master by infusing the meat with fresh lemons, rosemary, thyme, and whole garlic. The addition of chicken stock and some surprise white wine also keeps it from becoming too dry while cooking. Serve with the mashed potatoes or Caesar salad above for a complete meal everyone can enjoy.